Huey Long improved healthcare in Louisiana by expanding the Charity Hospital System, creating the Louisiana State University Medical School, reforming institutions to care for the disabled and mentally challenged, and providing free health clinics and immunizations statewide. As a result, mortality rates dropped dramatically in just a few years. Long initiated the expansion of the state’s two Charity Hospitals to create a network of public hospitals accessible to the poor. Capacity at New Orleans’ Charity Hospital was more than doubled, reducing the death rate by 30 percent. He also founded the LSU Medical School, a modern training institution adjacent to New Orleans’ Charity Hospital. 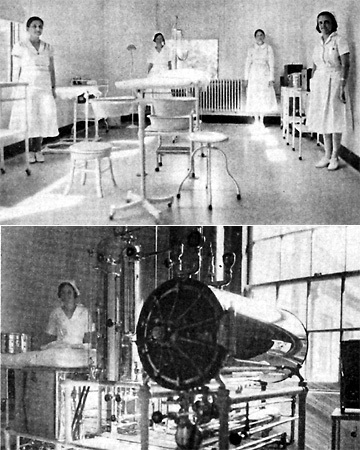 Huey Long modernized Louisiana's hospitals, with new treatment rooms and sterilizing equipment. 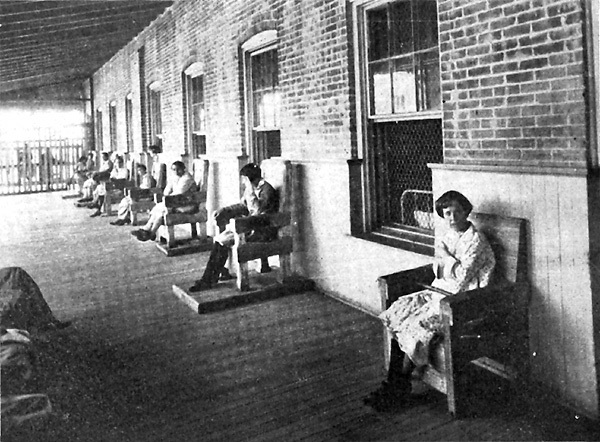 Long modernized and expanded the state’s institutions for its neglected disabled and mentally ill patients, abolishing the practice of chaining patients to their chairs in plow stocks and providing modern therapy and dental care. His administration also built institutions for mentally disabled children and epileptics. He reformed the prison system by providing inmates dental and medical care. Through the Board of Health, Long tripled funding for public healthcare. The state’s free health clinics grew from 10 in 1926 to 31 in 1933, providing free immunizations to 67 percent of the rural population. By expanding the state’s network of roads and bridges, Long made it possible for citizens – especially the rural poor – to seek professional healthcare and hospitalization. 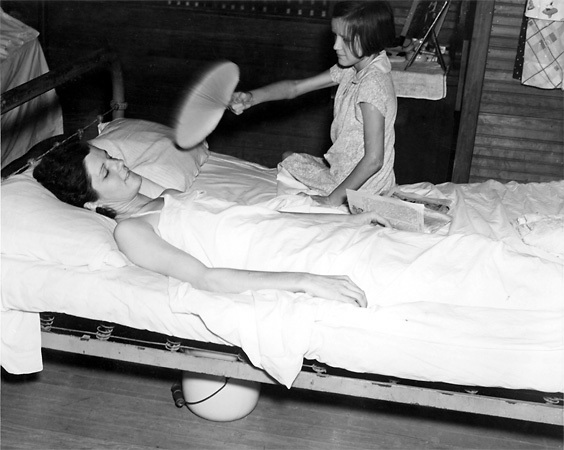 A little girl in 1938 fans her sick mother, who works in a box factory. Huey Long greatly expanded access by the rural poor to professional healthcare. 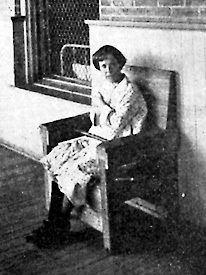 Before Huey Long's reforms, patients at the Central Hospital for the Insane were locked in chairs during their 'recreation' time. Long established the LSU Medical School in New Orleans, locating it adjacent to Charity Hospital. At the time, Louisiana had only one medical school at Tulane University, and the state was in dire need of new doctors. Construction for the new school was completed in six months, and by 1935, the LSU medical school had 900 students. "I attended LSU medical school and studied at Charity Hospital and know that [Huey Long] was so instrumental in creating those entities. The education I received at that time was of the best one could buy. Mr. Long began seriously improving LSU in Baton Rouge in 1928, including its sports and football program and we all know how important all of that is today for the students, alumni, and citizens. 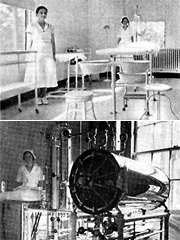 The LSU med school in New Orleans opened in 1935 and was one of the most influencial med schools in the nation in many areas. It was hit hard by Hurricane Katrina but is coming back to greatness. The Charity Hospital in New Orleans was begun in 1732 and by 1860 operated 1000 beds for the needy. 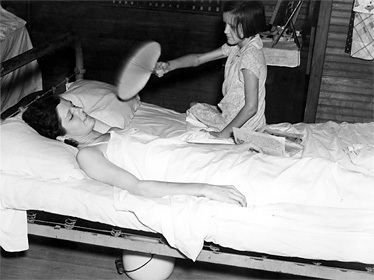 With Mr. Long's leadership it was operating 3000 beds by 1939. I am witness to the superbness of that hospital and the teaching programs run by LSU and Tulane medical schools there. Charity Hospital, aka, "the big free", is closed now but will live again. Its sister operations still thrive in Shreveport."